Could Vermilion County become a major vacation destination – such as the Wisconsin Dells or Branson, Missouri? Vermilion County Board Chairman Mike Marron thinks it is a possibility. ‘’Why not? You know you look at a place like the Wisconsin Dells, and what do the Wisconsin Dells have? They’ve got a nice river up there. Well, we’ve got a nice river,’’ said Marron. ‘’We’ve got a beautiful lake. We’ve got wonderful golf courses. People come here all the time. We’ve got great fishing. We’ve got great hunting. We’ve got some of the best hunting in the state. We’ve got some of the best mountain biking trails in the state,’’ added Marron. 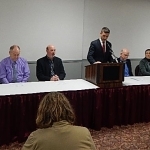 Plans to promote the county as a vacation destination are just part of a new Vermilion County 2025 Strategic Plan outlined Wednesday. Some other initiatives in the plan include formation of working groups in areas including jobs, health care and mental health, and improving communications. State Representative Chad Hays says if the county can secure a highly-competitive federal grant to improve communications he believes it would help attract new tourism events. Marron says the idea for the 2025 Strategic plan began with a handful of County Board members from both political parties. They hit the road and attended numerous city council, village board and community meetings across the county to seek input for it. ”The great thing about the responses was that while they know we have problems and a lot to do, the people who live here believe in this county and are proud of all the good things about it,” said Marron.